New Way® Air Bearings offers thrust bushings to compliment our air bushing product line. If you’re looking for frictionless, rotary motion that doesn’t move linearly, then our thrust bushings are the product you need. The thrust bushings consist of a hollow cylinder of our Porous Media Technology™ whose outer surface is encased in an aluminum housing. In order to prevent linear motion, we added a thrust face that is also made from porous carbon. 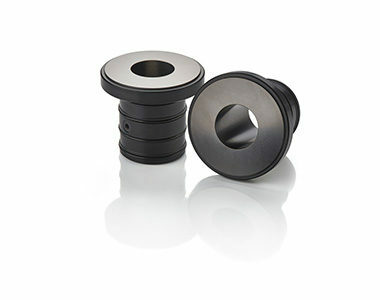 These bushings are found in many rotary applications such as turbochargers in high-performance automobiles. The porous carbon that comprises all our air bearings creates a reliable, stiff air gap between components. Air that is fed through the bearings must make its way through tortuous passageways that naturally occur throughout the carbon substrate to reach the surface. This arduous journey leaves a uniform distribution of air at the surface of our bearings. With no contact between components, our bearings never wear out and the soft carbon substrate means knicks and scratches won’t affect the distribution of air over the surface. Our bearings are crash and wear resistant. 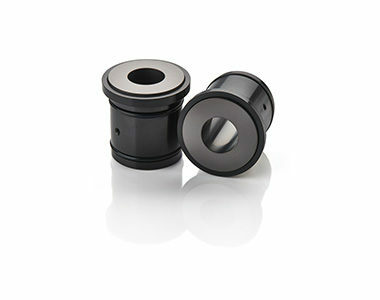 Thrust bushings come in both metric and English sizes to fit your applications. Reach out to New Way today to find out how our Porous Media Technology can transform your manufacturing process. New Way thrust bushings are available in metric and English sizes making them easy to integrate into your current process. Contact us today about your manufacturing needs. Our technicians are available now to discuss how our porous media technology can enhance your process. Tell us more about your application today.